Project Marble: We are prioritizing CPU/RAM usage of the emulator as part of Project Marble. In addition to the top most annoying issues, we would like your feedback on all aspects of emulator resource usage and performance, especially if you are running a machine with 8 GB of RAM or lower. In general, we would like to make running the emulator much more viable on machines with less RAM and less powerful CPUs. Fixed issues where the emulator did not minimize properly or could not be restored from a minimized state. The emulator's CPU usage stats for main loop and vCPU threads can now be displayed in the console when the environment variable SHOW_FPS_STATS is set to 1. This can be useful for sending feedback on excessive CPU/RAM usage situations. For our CI users: The emulator no longer causes Qt and its dependencies to be linked when started with the -no-window flag. This allows the emulator to run on machines with more minimal configurations due to assuming the existence of fewer system libraries in addition to improving resource usage. The emulator UI is now based on Qt 5.11. For upcoming system images, the emulator now supports Hardware Composer 2.0. This should result in lower driver overhead when running most animations. The emulator build is now based on CMake/Ninja. The Windows 32-bit build has been removed. This will break compatibility on 32-bit Windows systems. We did this to ship a smaller download and to better focus our resources on what the vast majority of users seem to be using. Please let us know if this removal does not work for you. We plan to release updated system images for the broken combinations that are widely used, and/or make a previous emulator build always available to run the older images. Please let us know if this removal does not work for you, and what combinations of 32-bit build / QEMU1 are critical to your use case. Emulator 28.1.0 is now available in the Canary and Dev channels. OnClick: now supports multiple OnClick per MotionScene. Important: motion:mode has been renamed to motion:clickAction. <Motion> : easing, arc motion, etc. Emulator 28.0.22 is now available in all channels. Emulator 28.0.22 is now available in the Canary and Dev channels. This release includes a fix for a Lint performance regression introduced in Android Studio 3.1. With this fix, the Lint performance has improved as much as 4X compared to Android 3.3 RC2. Fix for "go to definition" for layouts, drawables and other file resources coming from AARs. Issue#120196378: Java 8 language support, as requested by android.enableR8.desugaring=true in your gradle.properties file, is not supported when android.enableR8=false. Issue#120168590: When enabling R8 full mode, it removes a field that is being used. Android Studio 3.3 Release Candidate 3 (RC3) is now available in the Beta channel. An editor intention action was added, so that you can use well-known classes like RecyclerView or WorkManager in the editor and, if unknown, it automatically suggests the right Gradle artifact to import from http://maven.google.com. Android Studio 3.4 Canary 9 is now available in the Canary and Dev channels. Bulk import: You can now import multiple drawable assets at once by either dragging and dropping them into your Resources tool window or the Resource management import wizard. The wizard can also convert your SVG files into VectorDrawables. Drag and drop assets: From the Resource management tool window you can drag and drop drawables onto the Layout Editor design and text view surfaces. View alternative versions: You can now view alternative versions of your resources by double-clicking a resource within the Tool window. This view shows the different versions you have created and the qualifiers that were included. Tile and list views: You can change the view within the tool window to help visualize your resources. If this tool window does not appear in your Canary build, you can access it by selecting View > Tool Windows > Resources. For more information on this feature and others, see New features in Android Studio Preview. Issue#119210741: Lint offers auto fix to incompatible Android Gradle Plugin versions. Android Studio 3.4 Canary 8 is now available in the Canary and Dev channels. Some users are experiencing kernel panics in the GPU driver when file-backed RAM is saved on exit. This version includes an attempted fix that cleans up the file mapping earlier. Emulator 28.0.21 is now available in the Canary and Dev channels. https://issuetracker.google.com/issues/120951634 Some users are experiencing kernel panics in the GPU driver when file-backed RAM is saved on exit. This version includes an attempted fix that cleans up the file mapping earlier. Fixed an issue in macOS 10.14+ where the virtual scene camera mouselook control could become too sensitive due to an interaction with new accessibility security settings. Fixed an error in timezone calculation that could result sporadically incorrect setting of the emulator clock. Emulator 28.0.20 is now available in all channels. This is a maintenance release to fix issues both longstanding and arising from 28.0.16. Emulator 28.0.20 is now available in the Canary and Dev channels. Fixed an issue when running the emulator in OpenGL ES 3.1 mode where shaders would fail to link. Fixed rendering errors in various cocos2d and Unreal engine apps. If you are interested in or are currently using the emulator for game development, we are interested in making that experience as high fidelity as possible and would appreciate feedback in Issuetracker. Emulator 28.0.19 is now available in the Canary and Dev channels. R8 now supports Android library projects. Issue#116747159: Task generateDebugR2 fails on 3.3a12 when generating separate R classes. Issue#119536413: Convert FixStackFramesTransform to a task. Issue#112158840: Templates use deprecated classes if theme isn't appcompat. Issue#116541301: Databinding v2 produces errors when another annotation processor fails. Android Studio 3.4 Canary 7 is now available in the Canary and Dev channels. With this update, the minimum version for Butterknife is now 9.0.0-rc2. Gradle was passing the databinding JAR two or more time to R8, causing APK builds to fail with a TransformException. The classpath was computed in a way that included library artifacts more than once. The Kotlin plugin was throwing databinding exceptions. The layout editor would not zoom in if the device size was 10% or smaller. Lint would generate StaticFieldLeak warnings even when using the application context. Android Studio 3.4 Canary 6 is now available in the Canary and Dev channels. lintFix will no longer abort if errors are found. Class instrumentation before method inlining caused issues with Jacoco Gradle plugin. ANDROID_SDK_ROOT was not being used correctly. C++ code completion didn't work with external CMake. Running Lint from the command line was returning false negatives in some cases. Android Studio 3.4 Canary 5 is now available in the Canary and Dev channels. Updated with all bug fixes in recent Pie Google APIs system images. The Webview prebuilt has been updated to 69.0.3497.100 to fix compatibility issues and black screen problems when playing video. Fixed flaky network connectivity issue caused by using wrong apns-conf.xml. Emulator 28.0.17 is now available in the Canary and Dev channels. Emulator Pie Play Store System Images for both x86 and x86_64 are now available in all channels. Fully CTS/CDD compliant with support for Wi-Fi peer-to-peer when using Emulator 28.0.17+. If using experimental DSL block postprocessing options, tree shaking is enabled by default. In your DSL, using android.getBootClasspath() will now return the correct bootclasspath in cases when Java 8 language features are used. Guava-inspection was not reporting certain errors related to minSdkVersion. Layout preview pane would be blank when an XML layout file contained a custom view that threw an error. Android Studio 3.4 Canary 4 is now available in the Canary and Dev channels. Builds created using Bazel Build would throw "Build Event Protocol update failed" errors. Jetifier caused AAB builds to fail and forced Dagger 2.16 to be used, even when 2.17 was declared as a dependency. Composite builds would fail on the Windows platform. Timber would cause Lint checks to occur on projects where Lint checks weren't defined. Project compilation would sometimes fail because of an error accessing manifest fields using reflection. J-style lambdas would create self-recursion, leading to null-pointer exceptions and stack overflows. For information on new features and changes in all previous preview releases of Android Studio, see the Android Studio Preview release notes. For details of bugs fixed in each preview release, see previous entries on this blog. Android Studio 3.3 Beta 4 is now available in the Beta channel. if there are any problems with 28.0.15, and with 28.0.x in general. Emulator 28.0.16 is now available in the Canary, Dev, and Beta channels. This is a candidate for stable release. We will release this to the stable channel soon, and are actively seeking last-minute feedback before then. Please file an issue in Issuetracker if there are any problems with 28.0.15, and with 28.0.x in general. Fixed issue where snapshots were improperly discarded on a freshly resized Play Store image. Emulator 28.0.15 is now available in the Canary and Dev channels. This is a candidate for stable release. We will release this to the stable channel soon, and are actively seeking last-minute feedback before then. Please file an issue in Issuetracker if there are any problems with 28.0.15, and with 28.0.x in general. Android Studio 3.3 Beta 2 is now available in the Beta channel. On Linux, btrfs filesystems may cause extreme slowdowns due to auto-snapshot-saving mechanisms and the emulator already employing copy-on-write for its virtual disk devices. For users on btrfs or other copy-on-write filesystems, we recommend cleaning out the ~/.android/avd directory and running chattr +C on an empty ~/.android/avd. In 28.0.14, new snapshots will be created in a folder where copy-on-write is disabled. Emulator 28.0.14 is now available in the Canary and Dev channels. The addition of the File > Re-Import Gradle Project command. Manifest Merger did not support including '+', '-', and '.' in schemes. The Event Log window was not consistently representing the status of the Scroll to the end button. Android Support plugin was causing Android Studio to crash. Gradle could not find the symbol for data binding. Android Studio 3.4 Canary 2 is now available in the Canary and Dev channels. To improve app performance while profiling, you can now choose a mode for live memory allocation tracking on devices running API level 26 or higher. Choose from Full (all object memory allocations), Sampled (periodic sampling of allocations), or None. Android Studio 3.3 Beta 1 is now available in the Beta channel. Reduced the size of the HAXM installer for Windows. Emulator 28.0.12 is now available in the Canary and Dev channels. This update fixes several bugs. For a list of fixes in this update, see the Android Studio 3.2.1 release notes. The Android Studio 3.2.1 bug-fix update is available in the stable release channel. META-INF/proguard/* paths are now excluded from APKs/AABs. The Android Gradle plugin now uses SDK Build Tools version 28.0.3 by default. You can also enable the flag by passing -Pandroid.debug.obsoleteApi=true from the command line. Android Gradle plugin can once again run an androidMockableJar task. Android Studio wasn't properly displaying previews for adaptive icons. Translation Editor was displaying columns incorrectly. Android Studio 3.3 Canary 13 is now available in the Canary and Dev channels. Android Emulator 28.0.10 is now available in the Canary and Dev channels. Fixed an issue where the emulator would sometimes incorrectly report "Guest hasn't come online" if the currently running app lacked animation. Delete Unused Directories Dialog: When a new major version of Android Studio is run for the first time, it looks for directories containing caches, settings, indices, and logs that are associated with old versions of Android Studio for which a corresponding installation can’t be found. When found, a dialog displays their locations, sizes, and last-modified times and provides the option to delete them. Some deprecated kotlin-stdlib-jre* artifacts were still being used when creating new projects. AAPT2 was crashing when project folders were on a different drive than the build folder. Android Studio 3.3 Canary 12 is now available in the Canary and Dev channels. We strongly recommend against updating to Kotlin 1.2.70. Android Studio includes a version of Kotlin 1.2.61 that fixes a bug that can cause Android Studio to hang. Kotlin 1.2.71 and later also include this fix. Kotlin 1.2.70 does not include this fix. A future update of the Android Gradle plugin is intended to address this issue. For an overview of what's new in this release, see the release notes. 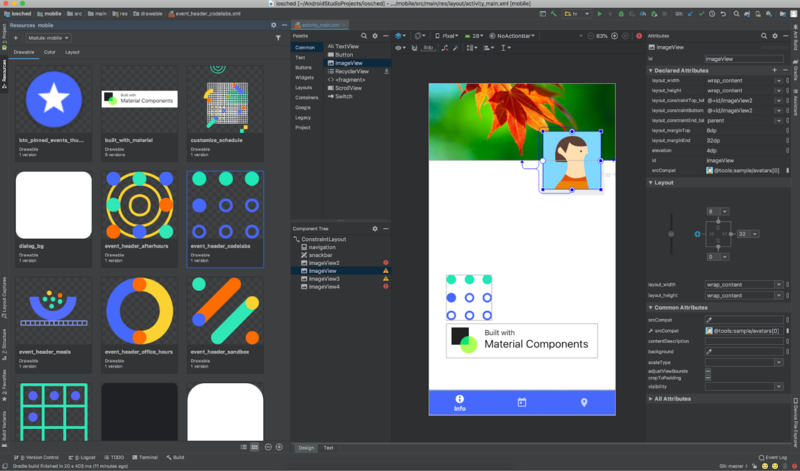 Jamal Eason, a product manager on the Android developer tools team, has an excellent overview of what's new in Android Studio 3.2 on the Android Developers blog. Android Studio 3.2 is now available in the Stable channel. You can download it here. (software rendering in the guest) has been deprecated. API 28+ system images will now auto switch to using Swiftshader (-gpu swiftshader_indirect). Android Emulator 28.0.9 is now available in the Canary and Dev channels. Improved incremental Java compilation when using annotation processors: This update decreases build times by improving support for incremental Java compilation when using annotation processors. For projects that include Kotlin code: Incremental Java compilation is enabled by default, even if your project uses the data-binding or retro-lambda plugin. If the annotation processors you use all support incremental annotation processing, incremental Java compilation is enabled by default. When you include this flag, Gradle executes the annotation processors in a separate task and allows the Android plugin to enable incremental mode for the Java compilation task. Note: If your project uses the Lombok annotation processor, incremental Java compilation may be disabled. Android App Bundles now support Instant Apps: Android Studio now includes support for building Android App Bundles with full support for Instant Apps. In other words, you can now build and deploy both installed app and Instant App experiences from a single Android Studio project, and include them in a single Android App Bundle. You can then add dynamic feature modules that are instant app-enabled by selecting File > New > New Module from the menu bar and then selecting Instant Dynamic Feature Module from the Create New Module dialog. If you already have a project that supports Dynamic Delivery, you can still add instant app-enabled dynamic features using the New Module wizard, as described above. However, keep in mind that doing so also enables instant app support for your app’s base module. To deploy your app to a local device as an instant app, edit your run configuration and check the box next to General > Deploy as instant app. Support for Clang-Tidy: Android Studio now includes support for static code analysis using Clang-Tidy for projects that include native code. To enable support for Clang-Tidy, you need to update your NDK to r18 or higher. You can then enable or re-enable the inspections by opening the Settings or Preferences dialog, navigating to Editor > Inspections > C/C++ > General > Clang-Tidy. When selecting this inspection in the Settings or Preferences dialog, you can also see the list of Clang-Tidy checks the IDE enables and disables by default under the Option section of the right-most panel. To enable additional checks, simply add them to the list and click Apply. To configure Clang-Tidy with additional options, click Configure Clang-Tidy Checks Options and add them in the dialog that opens. Fixed an issue in Layout Editor that was causing java.lang.NoSuchMethodError when previewing a customized date. Android Studio 3.3 Canary 11 is now available in the Canary and Dev channels. The Quick Boot notification icons have been revised to be more understandable to non-English-speaking users. Android Emulator 28.0.8 is now available in the Canary and Dev channels. Users have reported that the emulator has been slow recently. We have found that a possible cause of slowdown is that the temp directory for the emulator ends up with too many stale files inside. As a workaround, in 28.0.8+, we do not store ADB liveness check files in that directory anymore. However, it may also help to delete the contents of that folder. Make sure that no emulator is running when deleting those files. IntelliJ IDEA 2018.2.2: The core Android Studio IDE has been updated with improvements from IntelliJ IDEA through the 2018.2.2 release. When you change the width or height of a view in the Layout Editor without specifying a unit, Android Studio now appends a default dp unit value in both the Layout Editor and the corresponding XML. Gradle now copies extracted ProGuard rules to the local project build directory instead of the root project build directory. This ensures that tasks from different projects do not share the same output directory, which can lead to Gradle synchronization issues. gradlew clean command was occasionally failing. Android Studio wasn't correctly reporting some of the possible values for android:fontFamily. Layout Editor Preview window wasn't scaling images properly. Android Studio 3.3 Canary 9 is now available in the Canary and Dev channels.